mentions in the aforementioned surah. The color and flavor of honey they produce differs depending on the nectar source. To really appreciate this surah, go online and watch a video about how bees make honey. It’s a real-life example you can share with others when explaining that the Qur’an could have only been revealed by Allah. If you have kids in your family, watch it with them and help them understand the wisdom and lessons in the surah. Being part of a team makes us all feel special and our family is the first ‘team’ we join. Whether you’re a dad, mum or child, we can all contribute to the success of our family. This also teaches us humility. 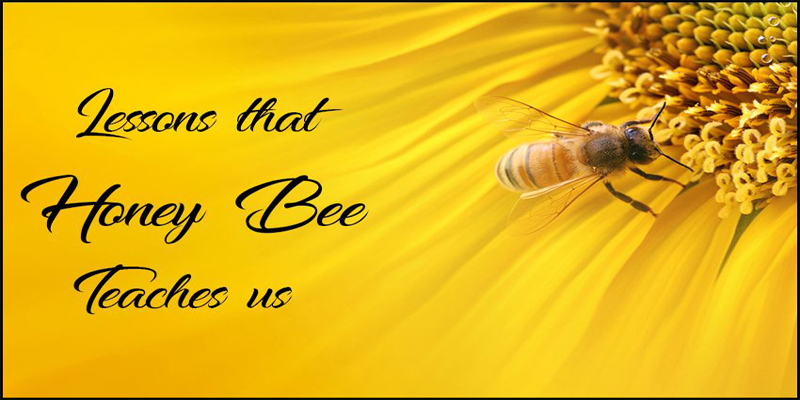 The goal of a humble honeybee is to play its part in producing honey, while the ultimate goal for a Muslim family is to achieve Allah’s pleasure and attain jannah. Just like a tiny bee, our individual role is crucial in our family; if mum decides to let her kids play on the laptop for hours or dad chooses to spend more time at the gym than with his kids, then everyone in the family will suffer, because the main role is not being played or sought after. Allah commands bees to make homes in mountains, trees and hives that people construct. As a direct result of that command, we are able to have bee farms and can harvest and enjoy honey. In effect, Allah has placed bees at our service! Subhan Allah! I envy honeybees for the simple yet extremely productive life they lead: they are highly organized, focused and produce amazing results as a team, all through obeying Allah’s command! Let’s aim to live productive and meaningful lives through obeying Allah: by decreasing the bad habits in our lives like listening to lewd music, watching vulgar TV shows and un-Islamic socializing. Let us also replace those with better habits like reading Qur’an, watching beneficial videos, surrounding ourselves with good people, or simply going to the park with our family and appreciating Allah’s magnificent creation! Our rizq is guaranteed by Allah. It’s up to us to decide how to attain it. Bees live together in well-organized hives where every bee has a role to play in its community. The queen bee lays the eggs while worker bees clean the hive and keep the hive’s temperature cool. Some bees protect the hive from intruders while others fly for miles to collect nectar. When a bee returns to its hive, Allah taught it to do a little dance (it’s called the bee dance) to show the other bees the coordinates of the flowers so they can go and feed. A bee cannot survive or make honey on its own; it has to cooperate with its fellow bees. When honeybees work together they produce more honey then they need, and people can benefit from its healing properties. When Muslims work together for the sake of Allah we too can help humanity by engaging in da’wah, building masjids, setting up Islamic schools and doing charity work.